Following is a telegram code "dictionary" used by Japan military that already decoded the Chiang Kai-shek KMT army telegram code during World war 2. Even USA military know about such "open code", but USA never notify Chiang Kai-shek about the issue of leaking military secret, because USA itself want to know KMT army movement. and contains the image below. Question: How frequently did the KMT used telegrams to communicate, from where (roughly) and to whom? 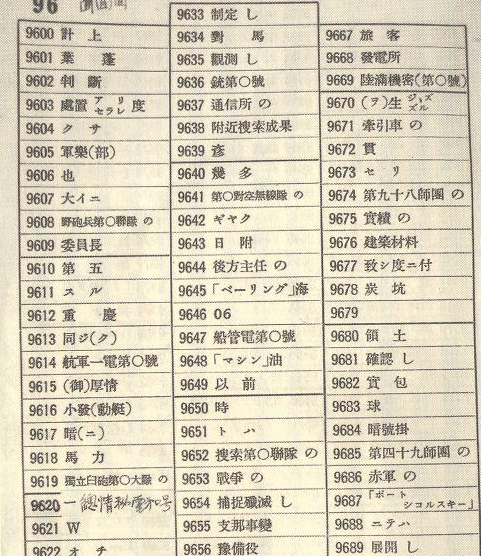 As pointed out in comments (1, 2) the data may never have been considered particularly "secret" as the code book in the image was used primarily to change Chinese characters encoded as numbers (a form transmittable via telegram; a method of endoding) into Japanese. See also Ciphers vs. Codes. You might be interested in a paper "Decryption in Progress: The Sino-Japanese War of 1894-1895" appearing in pp. 9-20 of an issue of The Cryptologic Quarterly by Greg Nedved. This well-documented paper describes use of code books for encryption purposes by the Chinese government half a century before the time frame of the OP's question. I am not myself an expert in the period or the region, but will bravely hazard: that the KMT used such cryptography often, between various headquarters for all official business. As did all armies throughout the world at the time. For various reasons military organizations prefer written orders and reports to spoken ones, and the telegraph (in the forms of manual Morse or teleprinter, carried by land line or radio) were the timeliest and (hence) main means of sending them. The nature of the Chinese writing system makes the use of code books, whose digital code groups might be subject to so-called superencipherment, more practical than then the use of cipher machines like the famous Enigma machine used in Germany up to the end of the Second World War. Not the answer you're looking for? Browse other questions tagged world-war-two military china communication or ask your own question. Did the German Enigma machine use multiple encryption keys? How did the primary means of communication between the British government in Delhi and UK change during WW2? How did the use of tanks differ in the Pacific war from the European war?